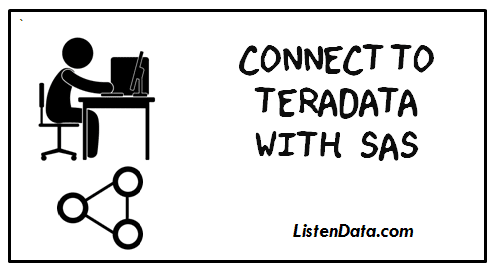 This tutorial explains how to connect to teradata using SAS. It is an efficient approach to work with teradata tables as we are telling SAS to connect to teradata and run the code in the teradata server directly. In simple words, we are creating Teradata SQL statements and then pass them to the Teradata server for execution. Only Teradata SQL functions would work within "connection to teradata" code. For example, INPUT PUT functions would not work. Instead, cast function would be used for changing variable type. user = provide username of your teradata account. password = provide password of your teradata account. The EXECUTE BY teradata method works for creating volatile tables. Many teradata statements and functions work only inside EXECUTE BY teradata method. For example, RENAME teradata table does not work without EXECUTE BY. The following code would work using with or without EXECUTE BY function. Note : In the code above, foo is a library name in which teradata table would be stored. Suppose you are writing a lengthy code in which you need to create a lot of volatile tables and access these tables in the following (subsequent) steps in SAS. Step 1 : Prior to creating volatile table, you first have to create a reference of your library with libname statement and including CONNECTION=GLOBAL and DBMSTEMP=YES options. libname tdref teradata user="userid" password="password" mode=teradata server="servername"
Step 2 : Create the volatile table with EXECUTE BY teradata method. See the detailed code specified in the article above. The first method "CONNECT TO TERADATA" is more efficient than the second method - LIBNAME statement as the first method hits the tables in teradata server and it would take less execution time. However, the sas functions such as INPUT, PUT, INTCK etc do not work inside the CONNECT TO TERADATA sql query. In the second method : LIBNAME Statement, all the sas functions and data step work. 6 Responses to "Connect to Teradata using SAS"
Thanks Richa for spreading the word. Cheers! I have a doubt,when I try accessing a teradata table from sas,I dont see all the variables because of the data type.How can I list all the variables of teradata table while accessing from sas. do u have any idea on code migrating from sas to python? A very extraordinary site. The material presented is very easy to understand for a beginner. It will be very helpful if the material is presented in pdf format. Thank you Deepanshu.